Ich (Ichthyophthiriasis) is caused by a parasite (ciliate), which most often is located in the skin and gills of the infected fish. The parasite is visible to the naked eye all over the body of the fish. This is probably the most common disease found in aquarium fish, but it is relatively easy to cure if we intervene in time. If you want to cure fish effectively, it is worth to at least a bit get to know the life cycle of the parasite that causes white spot disease, thanks to what we will start working at the right time, which will ensure that we will get rid of the “intruder” for good. The parasite feeds on the cells of the fish, as a result of which it grows and reaches a diameter of about 0.5 – 1 mm. (visible in the form of whitish spots). Treatment should be taken no later than 3 days after the onset of a characteristic rash. Then, the parasite is released from the fish, transforming into a developmental cyst and sinks to the bottom of the tank, or sticks to plants, decorations, the glass of the aquarium, or floats in water. The cyst parasite is immune to medication. Inside the cyst, progeny parasites grow, that is zoospores, which leave it and begin to look for another host (fish). The ability to attack the body takes from 10 hours to 3 days. If at that time a zoospore does not find a new fish, it falls down and dies. At this stage (zoospore) the parasite is the most sensitive to chemotherapeutics used in the fight against this disease. The rate of parasite development depends on the physico-chemical conditions prevailing in the tank, including temperature. – temperature: 30 * C, the life cycle is inhibited, but the parasite DOESN’T DIE! According to the principle of “Prevention is better than cure”, it is worth to avoid factors that cause the decrease in the immunity of our fish, thus exposing them to the parasite attack. 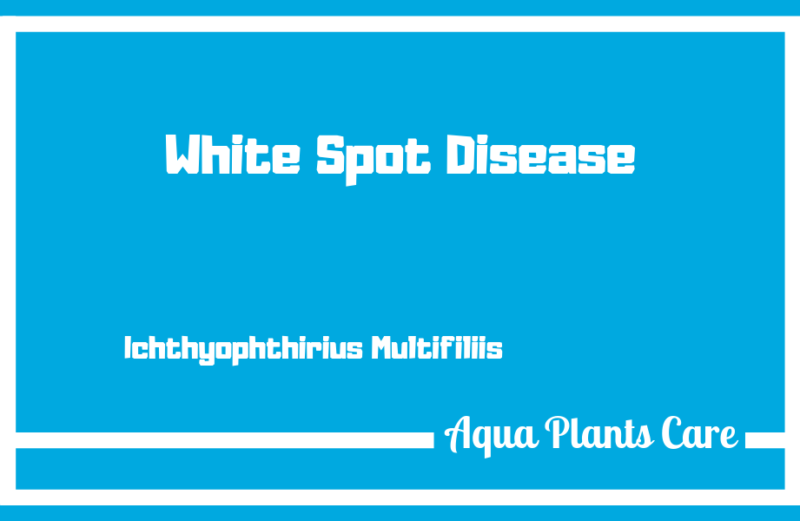 In turn, even the best carried out treatment may turn out to be futile if the fish continue to be in an environment that is unsuitable for them or still under the influence of factors conducive to getting ill.
How to recognize white spot disease? It is worth remembering that not every “spot” on the body of a fish must mean ich. Single, few, white spots (usually at the ends of fins, tail or fish mouth) can be caused by, for example, sporozoans, in turn very numerous spots, looking like a powder (usually smaller and visible only at the right angle) can be a sign of disease called oodinosis . IN A SEPARATE TANK (recommended, see also the article “Quarantine”): we do not place soil or plants, we aerate water very well (and of course we filter it), we do not feed fish. The general tank should be left without fish for about 10 days, without aeration (the parasite is sensitive to lack of oxygen), with efficient filtration. We treat all fish, including those that have no symptoms yet. We give medicines according to the manufacturer’s instructions. 2 method (risky – fish and plants may not survive): we raise the temperature to 32-33 * C, add aquarium salt 1g / 1L of water, the parasite dies within a few hours. After the end of treatment, we exchange 50% of the water in the aquarium, you can use activated carbon to remove the remaining medicine. When using salt for treatment, every day we exchange 20% of water for a few days to remove the salt from the aquarium. DAY 1: we give 10-15% more of the preparation than the manufacturer recommends, we maintain a temperature of 33 * C for at least 10 hours. (if the fish withstand it, we maintain it for the whole period of treatment), we strongly aerate water!